What can you do when your cat refuses to breed? My female Scottish Fold will not let the male mate with her. All the signs are there, but she fights him fiercely when he gets close. He even has scratches on his face. What can I do to help this mating along? Are one or both of these cats first timers? It's usually easier working with an experienced male. The good news here is that you have plenty of time. Dogs only come into season once or twice a year, so if you miss your chance you have a long wait for the next opportunity. Since cats come into heat about every two weeks, you can afford to take some extra time. First, although your female is showing the usual signs that might indicate it's time to breed, she still might not be completely ready. Her fierce fighting is good indication of this. I wouldn't try to force the situation as it is. Second, it may be helpful to let the cats spend time around each other without cooping them in together. If they each have enough room to retreat, your female may feel less need to attack. She may be willing to accept him if she has some time to get used to him. Third, if the male is not one of your own, and there isn't as much opportunity for the two to spend time together, you can request her owner let you borrow an item of his that would have his scent on it. Put it in her favorite resting spot so she can get used to his smell, and hopefully she'll warm up to him a little more. It's always easiest when we can let nature run it's course, but if you are determined for a mating to happen this time, I suggest you consult your vet and see what he/she suggests. Cats are usually allowed to breed many times over a heat cycle to ensure the female ovulates. If this pairing doesn't work out, you may need to find another male that she will accept. 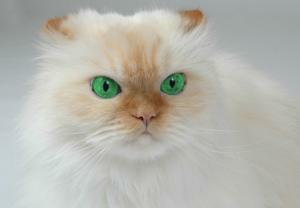 I currently breed Persian and Himalayan cats. I have two females, and one male. I have noticed that in the cold months of winter (even though he is indoors), my male is totally uninterested in breeding...even when my females are in heat. Come spring, he is ready again. Someone told me that if you keep a natural UV light on in the area they spend most of their time that it will encourage him to breed. Do you know about this? If this is the case, I will go buy one today! Thanks for your time. Excellent question! I have heard of the lights being used to induce heat in the females as felines are polyestrous. Polyestrous means that they tend to come into heat during certain seasons of the year. This is why you see many baby animals in the spring, for example. There are different phases in the cat's cycle and in the winter, when the days are typically shorter, the cats will be in the anestrus phase. The males will not be interested in mating during this time. The artificial lights can fool the cat's body into thinking it is a different season. It is typically recommended that you create either 12 hours of light and 12 hours of dark or 14 hours of light and 10 hours of dark, whichever works best for your cats. Hope this helps. As an added benefit, many houseplants love the lights. Be careful to choose plants that are not poisonous to your felines! Good luck!